Eye Candy Friday...or...There's a New Rooster In the Hen House!! I had HOPED to have a picture of the latest addition to Chicks with Sticks (the knitting group I am in).....but due to the lateness of the hour last night (and the exhaustion of the new mommy) I wasn't able to get any pics. Did you guess? 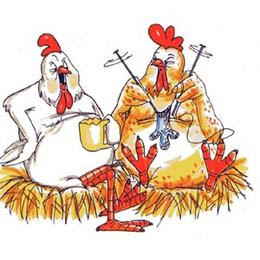 We have a NEW member of Chicks With Sticks.....although it may be a while before he can actually knit with us, we are all looking forward to the "Little Man" joining us for many, many Thursday night get togethers!!! (No doubt he will sleep well on Thursday nights after so much attention!!) LOL!! Our dear friend Ginger gave birth to a precious little boy late yesterday, their first baby!!! The ladies in our group had hoped to invade and all take turns starting the spoiling process of the Little Man but there is plenty of time and hope to have pics posted soon!! 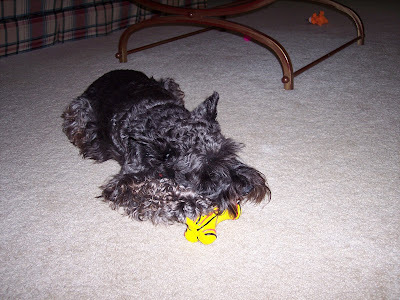 I Love My Max Dog!!! 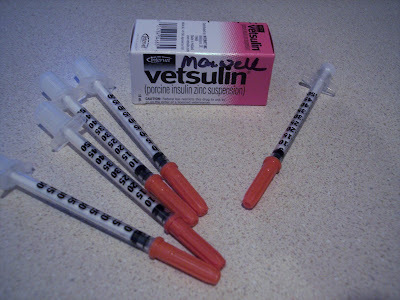 Latest Insulin on the market for dogs. Dr. Goodbody (no that isn't his real name...simply what I refer to him because...well...because the name says it all). Five ONE TIME syringes, manufacturers cost probably 1/10th of one red cent. Discounted price: $ 10 EACH. Yes.....that is for EACH!!!!!!!!!!!!! 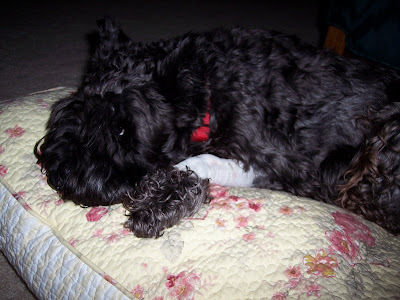 Insulin injection twice a day for the rest of his life. O.K. 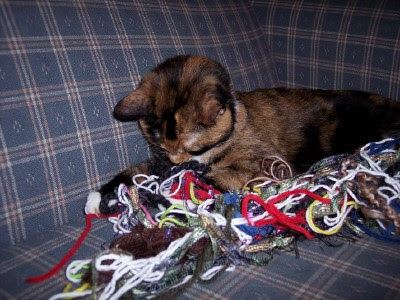 If I can JUST find the end to this one...I can roll it up, then get the end of that one, separate it from the red one....yep...I can have all this fun rolled up back into balls and in the basket before ANYONE knows!!!!!!! AHHHHHHHHH..........Take me away.....FAR, FAR away!!!!!!!!!! Judging from the box, I would have to say my little friend has enjoyed his travels....from Washington State to Alabama!!!! To save money, I ordered the wheel without a finish and had planned on placing a coat of polyurethene myself but I am now thinking that I may stain the wheel first. I do like the natural look, but after seeing a couple of stained wheels on blogs I'm thinking I may go with a stain. I'll make a trip to Lowe's tomorrow and check out my choices. Hopefully I'll have everything stained, poly-coated and assembled in the next few days!! I'm A Rag Tag Gal AND Kiwi Update!! Leave it to the the MOST talented Miss Emily to come up with a FUN (but most important) STRESS FREE dish rag swap!!!! 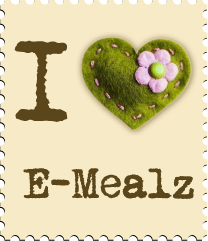 AND....while you are there check out her side bar for a so many cute links but especially the link to Shreddies TOO cute!!! Arrived in Colorado at 12:26 today!! Huh....come to think of it, my little Kiwi is getting to travel to more places than I do....even going so far as to visit two places I would love to visit! !...somehow this seems unfair....but I won't hold it against him!! LOL!!! In Transit - On Time......Oh Yeahhhhhh!!!! Kiwi has left the building!! I have been going NUTS wanting a spinning wheel.....I have never spun yarn but for some strange reason I have just not been able to let go of this!!! 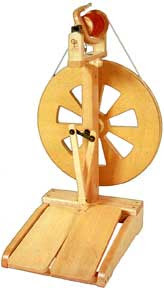 It has hounded me till I have finally given in.......I BOUGHT A SPINNING WHEEL!!! Oh...somebody pinch me so I'll know it's real!!! 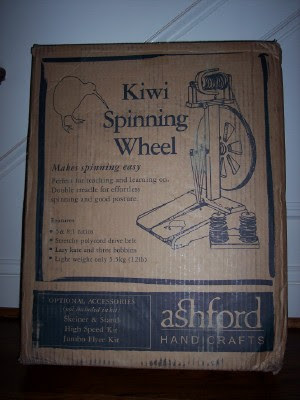 I had a very small budget...did WAYYY too much research but finally decided that for the money, options and resale value the Ashford Kiwi would fit my requirements....all but in the looks department that is. I would have LOVED to have a traditional style wheel. but I know for longevity (specifically my back)...I needed a wheel that would allow me to have the flyer situation directly in front of me, no twisting allowed thank you very much AND a wheel that would fit my VERY limited budget and apparently in the scheme of spinning wheels I have Champagne taste on a very cheap beer budget!! LOL!! I made this purchase quite on impulse late last night from an Ashford dealer that sells on Ebay. He has a 100% customer satisfaction rating for several years so I felt confident that I would be treated fairly. The gentleman selling the wheel could NOT have been nicer....he offered his toll free number with unlimited assistance. He specifically told me that he didn't care if it was 6 months from now that if I had any questions or concerns that I was to call him and that the only "stupid" questions were the ones NOT asked.....gee....wish I could get such wonderful service at other places!!!!! He told me he has helped many new customers to get started spinning with his instruction via the phone or the internet. His main goal he said was to be sure his customers learn to spin and that they grow to love the craft as much as he does!! How could I go wrong??? Bob...I don't know ya...but I love ya.....You Da MAN!!!!!!!!! Ashford Niddy Noddy (not sure what this is all about but I guess I'll learn) LOL!!! ALL for the retail price of the wheel!!!!! Shipped out today and H.O.P.E. to have it delivered Friday!!!!! Now...if I can only talk my DH into selling everything and moving to a sheep farm......Waaa! Haaa! Haaa! I'm Dreaming BIG time here!!!!!!!! Or is that Hallucinations from lack of sleep due to spinning wheel excitement??? LOL!!! Sorry all the text is running together on this post....for some reason Blogger doesn't like line breaks today!! Last Friday, I met Ginger at Bibby's house for the most WONDERFUL lunch!! Not only did we enjoy a FABULOUS home cooked meal but Ginger and I left with the most BEAUTIFUL Violet!! Bibby's home is absolutely GORGEOUS, filled to the brim with the BEST antiques and collectibles. Check out Ginger's June 1st post to see a display of Bibby's collection of antique chicken theme egg cups!! We are experiencing a level three drought here, the trees are showing signs of distress as well...which is very sad to me because most of the trees around me are the mega old trees and I hate the thought of losing any of them. 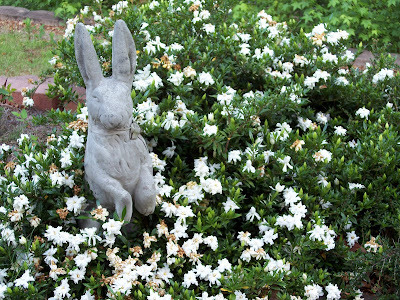 But...the gardenia's are in FULL bloom!!!! The smell is INCREDIBLE!!! 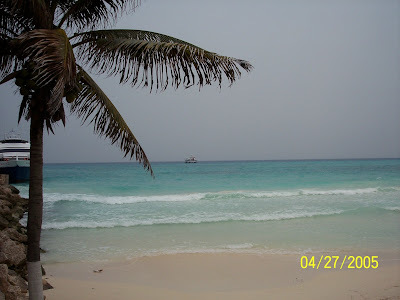 It is overcast today and hope to get a bit of rain today!!! BLUE MOON EYE CANDY!!! YUMMY!!! 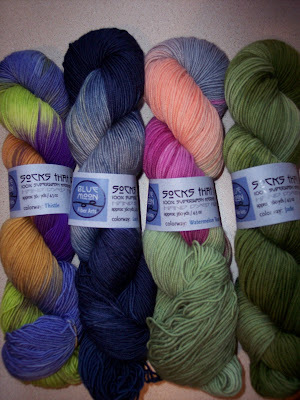 L to R: Thistle, Lucy In The Sky, Watermelon Tourmaline, Jade. 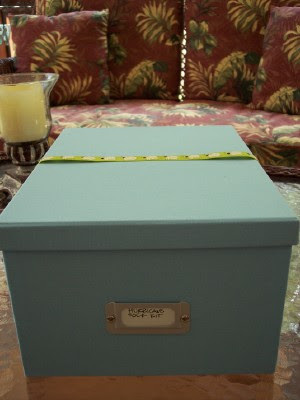 I already have a use in mind for the box!! 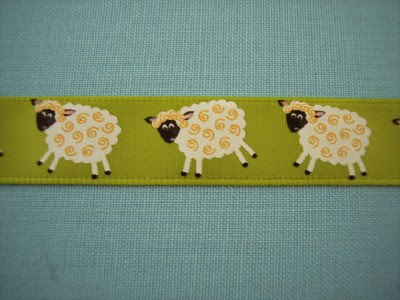 Wrapped in THE MOST adorable ribbon with sheep running across it!!! Upon lifting the lid.....I laughed.....one of those absolutely delightful laughs that bubble out when you are so excited you can't contain it!! JUST LOOK!!! It is like CHRISTMAS!!!! EVERY pkg. 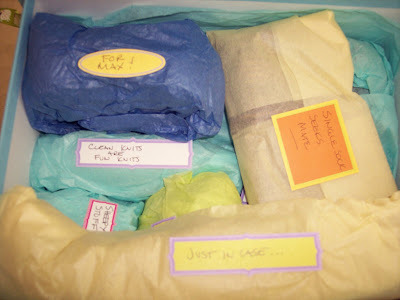 was wrapped and had the cutest tags......what a PERFECT idea!!! What creativity!! Each label was a different shape and color!! 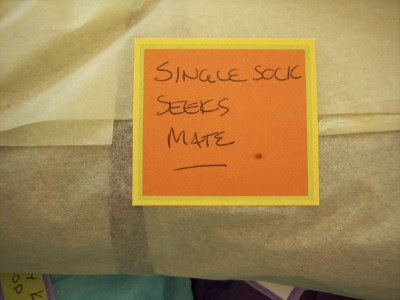 Hmmm...I'm thinking my sock pal needs to host a "single sock seeks mate" swap!! Just too cute!!! AND NOW.......UNWRAPPED and in all it's glory!!! OH MY.....the card is so cute with a little frog peaking out around the lily pad leaves....maybe a pic made by my sock pal? Stitch markers that spell out KNIT...in their own little carry case!! 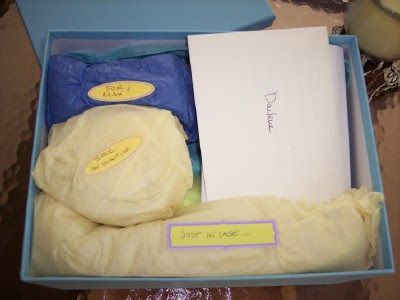 A gift for Max as well as Bella, how thoughtful is that!?! Some wonderful citrus soak which I have not used and can't WAIT to try!! Sheep stickers, sheep magnet, sheep notebook with pen...PERFECT size to keep in my knitting bag for jotting down my knitting notes!! A Lantern Moon sheep measuring tape....which I have been wanting 4-ever but just one of those things that I wouldn't pick up for myself!!! OH.....I have been to Michaels, looked at every craft department around town looking for a sheep rubber stamp and have not found one ANYWHERE!!! I jumped....I'm telling you I squealed and jumped up and down!!! The NICEST scissors.....now I know to some that might not be very exciting.....but there are some things that for whatever reason I just haven't bought.....my scissors in my knitting bag MAY have cost all of $1.00.....TERRIBLE scissors......yet I just never got a good pair....I am so very excited to have nice pair of scissors!! Not one...but TWO bars of emergency chocolate....which I'm thinking before the weekend is over there will be some kind of emergency (we are doing yarn work today which pretty much insures an emergency of one kind or another!! LOL!!) which will require me to consume said emergency chocolate!! LOL!!! I have never had either of these chocolates and can't wait to give them a taste!!!! TWO books on the Fiji Islands.....which would be my ultimate, if I could only take one fantastic vacation in my life.....it would be to the Fiji Islands!! One of the doctors that I worked for traveled extensively and the most wonderful trip he took was to the Fiji Islands....just listenting to all the stories he told left me with the incredible urge to one day go here......and you just never know......maybe one day I WILL make it...but until then I have two GREAT looking books to enjoy!!!!! Oh my.....now to the Sock and the Yarn(s)....yes...that IS plural!! 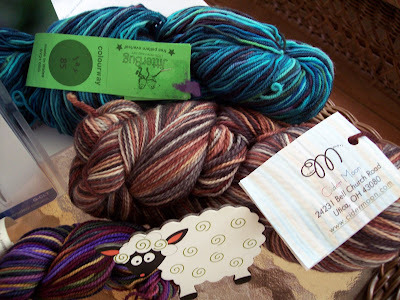 The yarn in the lower left hand corner is Claudia's Hand Painted yarn, Purple Earth color...which I LOVE these colors!!!!! An ENTIRE skein of Claudia's as well as what looks to me to be enough yarn to make the mate to my sock.....(my sock pal was afraid that I might not have enough to complete the second sock and added a second skein just in case)!!! 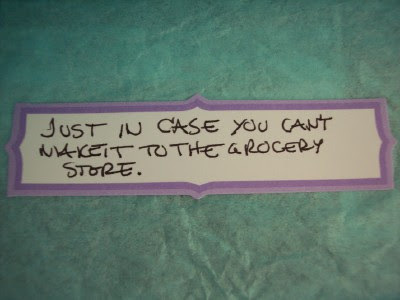 Incredibly thoughtful!! A skein of Cider Moon, in Birch Bark!!! PERFECT colors to wear with all the browns and blacks I wear!!! Oh....I have read SO many blogs showing socks knit with Cider Moon, no one around here sells it and I am SOOO tickled to have a skein to knit!!!! AND if that wasn't more than a person could possibly want or deserve......a skein of Jitterbug sock yarn, Jay 85...the most wonderful blues.....reminds me of the many colors of the ocean!!! Oh.....let me tell you.....my DH was laughing at all the squealing and jumping up and down that was going on!! LOL! And now for the sock!!! This pic is a tad light....the colors don't show up....but Oh LAWZY.....does this sock fit PERFECT!!! Not only does it fit my big foot....but it FEELS wonderful!! I have knit several pairs of socks and I always thought that they felt fine on.....but when I slipped this sock on it was like buttah.....like buttah I tell ya!!! It was like....well....like it was made just for my foot!! LOL!!! I am not sure if it is the yarn or the pattern or perhaps it is the talents of a "Master Knitter".....but this sock fits totally differently than socks that I have knit for myself!!!! I wasn't able to get a pic of the toe....but it looks machine made it is so perfect....and the heel.....this sock is absolute perfection.......I hope I can make a sock that is worthy of being worn with this beauty!!! During all the squealing and jumping around Max was going nuts.....it finally hit me that he KNEW there was something there for him....which upon receiving his treat he ran to the door wanting in and promptly set about testing the squeak component......which indeed passed his "inspection". 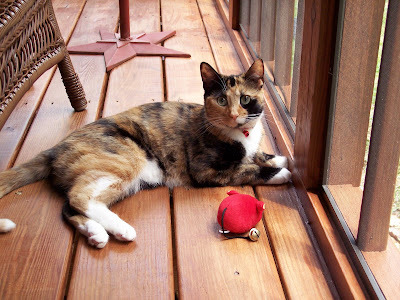 ahem...."killed" the mouse before I could get a picture.....I'm not sure how to make a video and post.....let's just say there was LOT'S of zipping around the porch with the mouse!!! She went NUTS when I pulled the string and watched it move on it's own!! LOL!! AND NOW......let me introduce my Hurricane Sock Pal!! JANE......of Quiddity!!!! I love Jane's blog title which means 'the essence of the thing'....which she states, 'This is the quality I strive to capture in all my creative endeavors'. 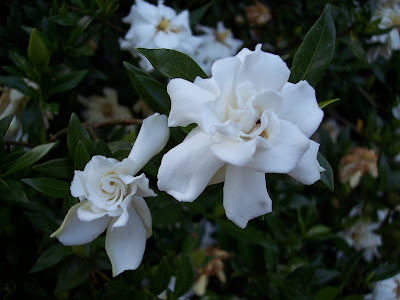 Which I can honestly say that once you visit Jane's beautiful blog you will know that she has indeed achieved "Quiddity"!!! Not only does her blog contain great knitting posts....her knitting pictures show great detail which I love but can't quite seem to achieve with my camera. 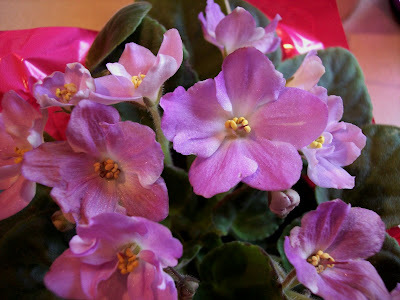 Jane obviously has many talents.....there are so many beautiful photos on her blog that are not knitting related!! Oh....and did I mention that she also spins???? Creative Goddess!! 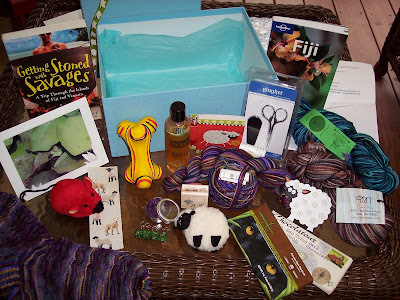 Jane, I can not begin to thank you for such a thoughtful, wonderful package that you sent me!! The time that you put into this is not without note and I want you to know how much I appreciate all that you did!! 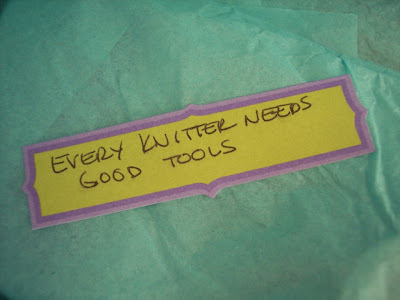 From your blog I gather what a creative woman that you are, not to mention a PHENOMENAL knitter.....the type that I hope to be some day....hopefully before I am too old to knit!! LOL!!! 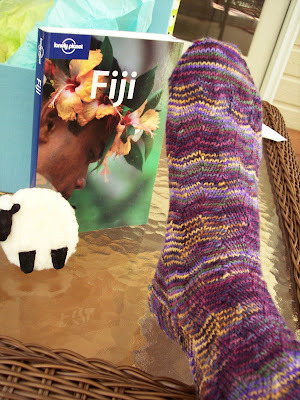 Eye Candy Friday & Hurricane Sock Swap Update!! Not the most beautiful picture I know....but I wanted to share this pic of Max. Max LOVES to swim in the lake.....but he loves to float on his noodle even more!! 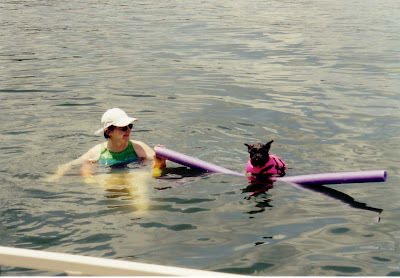 After swimming for a bit he will generally swim to HIS noodle, hook his front paws over the top and float around for as long as we stay in the water....the lifejacket and noodle keep him perfectly suspended!! Sometimes he'll kick off with his hind legs and go from person to person for a head pat (although he doesn't like his head to get wet as it is above).....but generally just likes to "hang out" on his noodle!! He has even been known to fall asleep and not wake up till his little face hits the water and he snorts in a big taste of the lake!! LOL!!! WHAT FUN!!!!!!!!!!! A BIG thanks to Christy for letting me participate!! !